BRISBANE, 1943. Overnight a provincial Australian city has become the main Allied staging post for the war in the Pacific. The tensions – social, sexual, and racial – created by the arrival of thousands of US troops are stirring up all kinds of mayhem, and Brisbane’s once quiet streets are looking pretty mean. Enter P.I. Jack Munro, a World War I veteran and ex-cop with a nose for trouble and a stubborn dedication to exposing the truth, however inconvenient it is for the -powers that be. He’s not always a particularly good man, but he’s the one you want on your side when things look bad. over a few rocks he’s not supposed to. Soon the questions are piling up, and so are the bodies. But Jack forges on through the dockside bars, black-market warehouses, and segregated brothels of his roiling city, uncovering greed and corruption eating away at the foundations of the war effort. him and the truth, which has its roots deep in the past. Friends, enemies, the police – they’re all warning Jack to back off. But he can’t walk away from a case: he has to do the square thing. fast-paced debut captures the high stakes and nervous energy of wartime, when everything becomes a matter of life and death. This book actually consists of two novellas. 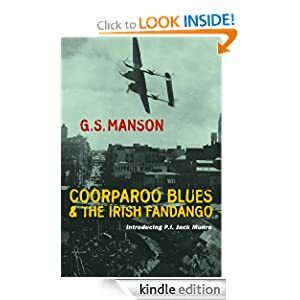 The first, COORPAROO BLUES, introduces Jack Munro, ex-soldier, de-commissioned policeman turned private investigator. Jack has been hired to find an absentee husband who has gone missing in wartime Brisbane (1943), where US troops are mounting the defence of Australia. Jack’s search for the missing husband turns up a link with a missing sailor, and connections with US MPs. The language is gritty and colloquial, typical of the criminal underworld and the seamier side of Brisbane, and the glossary provided in the final pages of the book will get plenty of use. The second story, THE IRISH FANDANGO, is set a few months later. The US troops have receded into the background, although obviously still there, and now we have political refugees and Communist activists. It begins with an apparent suicide being questioned and Jack is hired to find out why the dead man hung himself. Again, as in the earlier story, he touches nerves and begins to unearth things people want to keep hidden. As a veteran of World War One Jack is not backward in using violent methods to find out the truth, but then neither is the other side. Despite the fact that the stories are relatively short (just over 120 pages each) the plots are fairly complex. Descriptions that give time and place to the settings feel authentic and are quite detailed. This is a new area for Australian crime fiction and Jack Munro a quite different protagonist. A refreshing read, although I do wonder about its appeal outside Australia, mainly because of the colloquial dialogue. Author’s website: read the first chapter online.